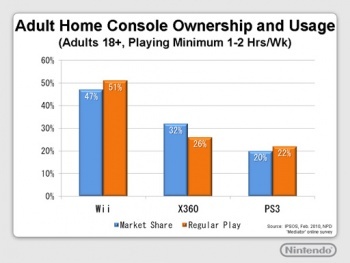 In an attempt to dispel the notion that Wiis just sit in homes gathering dust, Nintendo has claimed that adults use their Wii twice as often as Xbox 360 or PS3 owners use their consoles. If you asked most "core" gamers, they'd probably tell you that the people who own Nintendo's Wii play the console for maybe five or so hours - or however long it takes them to tire of Wii Sports - and then tuck it away in the corner, never to use it again. That is a stereotype that Nintendo says is patently untrue. At an analyst Q&A session at last week's E3 2010, Nintendo boss Reggie Fils-Aime said that data showed that more adults used their Wii than used the other two consoles. He cited a February survey from independent market research firm Ipsos that found that 51% of Wii owners over the age of 18 use the console at least one to two hours a week. This was in comparison to 26% of Xbox 360 owners and 22% of PS3 owners who said they did the same. "The share of play on Wii ... is higher than its share of ownership," said Fils-Aime, pointing to the Wii's 47% of market share versus 32% for the 360 and 20% for the PS3. Reggie also pooh-pooh'ed the claim that Wii sales were slowing down, referring back to the same Ipsos survey in which more people said they planned to buy a Wii in the next six months (11%) than those who said they were planning to buy a PS3 (8%), Xbox 360 (4%), iPhone (4%), or iPod/iPod Touch (3%) in the same time period. "Not only is purchase intent effectively that of the PS3 and Xbox 360 combined," Fils-Aime said, "[The data shows] that as many people plan on buying a Wii ... as the 360 ... iPhone ... iPod and iPod touch put together." These numbers may explain his confidence we reported on yesterday.